Sustainable development seeks to balance individual and world concerns. Knowing the definition of sustainable development and why it is important can help you make an informed contribution as a voter and consumer. While many people believe that sustainable development remains firmly in the environmental realm, this term actually encompasses economic and socio-political concerns as well. As with many current policies, the definition is also somewhat transient, as government agencies and individuals struggle to create the perfect balance to address all of these important issues. The goal of sustainable development is to allow growth the benefit humanity while encouraging a balanced approach that creates a minimal amount of harm. By carefully balancing future and current demands, most environmentalists hope that natural resources will always be available to meet essential needs. Most specialists who study sustainable development evaluate it as it affects three distinct areas. Currently many areas of economic growth are reliant on natural resources and land development. Economic sustainability places monetary value on these limited resources in an effort to use them fairly among the people of the world. Economic sustainability also relies on the idea that by shifting the dependence of the economy on these resources and valuing them properly, people in developing countries can have a better standard of life. The most commonly recognized type of sustainability, environmental sustainability, is itself a term that includes a wide variety of environmental issues of current concern. In general, environmental sustainability seeks the use of renewable natural resources over non renewable resources. It also encourages individuals to make changes in their personal lifestyle to create a smaller carbon footprint, reducing their impact on the global scale. 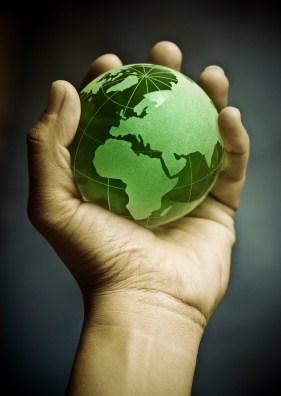 Common environmental initiatives such as recycling are also included under the heading of environmental sustainability. Sociopolitical sustainability concerns itself with factors that affect the well being of people and their governments. Therefore sociopolitical sustainability includes areas such as food production, food security, and poverty. These concerns include the disproportionate impact that poverty has on women and children and how to empower groups of people living in poverty to improve their welfare. It also is concerned heavily with education and working with groups and individuals to provide information that encourages sustainable development. This area also includes government cooperation to tackle widespread issues, such as poverty. Sustainable development is a popular idea among many types of decision makers, despite differing ways of applying sustainable ideas to policy changes. Currently there is a branch of the United Nations devoted to Sustainable Development, which focuses on enhancing the lives of global citizens in multiple ways. Sustainable development seeks to increase cooperation between different areas of government as well as governing bodies, encouraging international partnerships and initiatives. The UN branch seeks to also disburse educational tools and knowledge so that governments can make informed decisions. Sustainable development supporters also try to introduce laws to emphasize sustainable growth. The UN tries to provide analysis and reports that allow governments to make informed policy decisions. Implementing and providing assistance to use sustainable technologies, finance research, and obtain expert advice for developing countries is also a prime directive. UN officials have also adopted the Johannesburg Plan of Implementation that has specific initiatives designed to address individual problems in specific areas. Learning the definition of sustainable development is essential even if you're not a politician. Looking at all of the effects of individual decisions, instead of weighing a decision primarily on its economic or environmental merits promotes better decision making for all. However, because sustainable development is such a complex issue, a larger impact can often be felt if individuals focus on a single initiative that affects an area of interest.